Put these home improvement projects at the top of your “to do” list if you are thinking of selling your home? Or giving it a face lift? 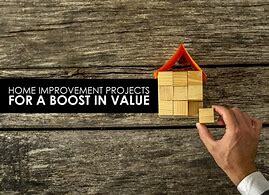 Consider upgrades that will boost your homes value and make it more appealing to buyers. Here are five home upgrades you won’t regret and are well worth the investment. The bathroom is one of the most valuable rooms in the house. And the second best room to renovate. Right after the kitchen. If you choose to undergo a full bathroom remodel, you could recoup 63.8% of the cost in resale value. Is it worth taking out a loan to help pay for your renovation? That depends how long you will live in the home before selling. And update the flooring, shower area, and fixtures may not cost all that much. Don’t want to spend a ton of money on a bathroom renovation? Make smaller changes first—start with new shower fixtures and a new sink faucet. You could also swap out your old shower curtain for a more modern one. Or upgrade your bathroom storage to woven baskets for a farmhouse-chic feel. Upgrading your walls with a fresh coat of paint is one of the easiest upgrades. And for cost-conscious homeowners it provides plenty of opportunities to showcase your personality. The average cost to paint a 120-square-foot room is about $100. Not much cost for a big impact. So consider painting all high-impact spaces like the master bedroom or living room. Additionally, if you’re trying to sell your house, opt for a neutral color. This will make your home more enticing to potential buyers. Invest in some decorative liner to give your cabinets a new look or swap out old knobs for new ones. This simple project is a good way to give your home a luxurious, modern feel. If you live in the southwest consider tile for your floors. The trend in the southwest is tile and area rugs. Or NO rugs at all. Bedrooms tend to be the exception. Also consider laying down tiles in the cabinet underneath your sink. Many people ignore this area, but you could make it a usable space with minimal effort. Another cost-effective home upgrade is replacing your old appliances. New appliances save energy and are a lot more reliable. And buyers don’t want to buy a home and then start spending money on appliances. Look for appliances that are ENERGY STAR certified. They use less energy and will save you money in the long run by reducing your electricity bills. If you don’t want to drop a ton of money on a new appliance, check your home warranty to see if it covers a replacement. Most warranties will cover appliances that have broken down due to normal wear and tear. So if you have one that’s starting to lose function, this may be your best bet. But be aware most will “fix” the problem but not replace the appliance unless it is not repairable. It doesn’t take much to enhance curb appeal. Schedule a weekend or two and spruce up the outside of your home. Tackle these easy tasks. Trim dead branches from trees in your front and backyard. While you’re at it, be sure to trim hedges and overgrown bushes. Stain your porch or deck. Pressure wash your driveway, sidewalk, and home’s exterior. Replace loose or missing shingles on your roof. Clean your gutters. Get rid of weeds and plant a small garden if you have the space. These items will depend on where you live. In Tucson and much of the southwest, we don’t have hedges and bushes. Cactus and natural desert foliage is the norm. And crushed granite and boulders a primary landscaping style. Water conservation is a state of mind. Most southwest homes don’t have decks. Why not. Termites. Wood decks are food carts to termites. But if you have a Ramada over your patio, get it cleaned, repaired and painted. And the photos on the Tucson MLS make a difference. You can spend lots of money on home improvement projects and staging. But if that effort isn’t correctly shown in the MLS photos, you are not getting the full benefit. These home improvement projects will help you home stand out to buyers. Today’s buyers don’t want to take on projects after they purchase a home. So having the “right” things done before you list your home is a big step to getting it sold.